Moscow criticized The Hague’s attempt to justify the incident, saying it was still waiting for an apology from the Netherlands and punishment for those behind this “provocation.” Experts predict deterioration in Russian-Dutch relations and do not rule out cancellation or postponement of the Dutch king’s visit to Russia. “The response by our Dutch partners was incomprehensible and unacceptable — not at all consistent with the usual level of Russian-Dutch relations,” Foreign Ministry spokesman Alexander Lukashevich said. Men in police uniforms forced their way into Minister-Counselor Dmitry Borodin’s home on the night of Oct. 5. The minister stated that they did not provide any identification and assaulted him, ignoring his declaration of di1plomatic immunity. He was forced on to the floor and struck on the head. The intrusion was explained by reports of child abuse received from neighbors. Borodin and his children were then taken to a police station and released three hours later, without any explanation or apology. Moscow’s reaction was fierce. “This is a crude violation of the Vienna Convention. We will respond depending on how the Dutch side behaves,” Russian President Vladimir Putin said on Tuesday, at a press conference following the Asia-Pacific Economic Cooperation summit. 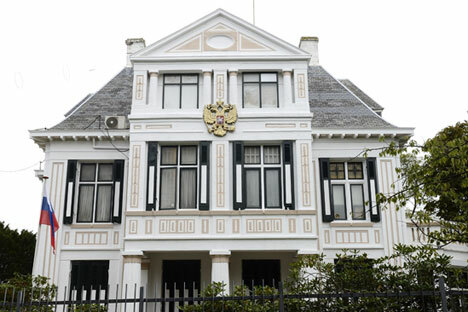 The Russian Foreign Ministry protested to the Dutch ambassador in Moscow. On Tuesday, Oct. 8, the Dutch were requested to furnish an explanation of the arrest of the Russian diplomat as soon as possible, “to conduct an urgent investigation in order to establish who was responsible for this illegal act,” to apologize to both Russia and the diplomat in question, and to reimburse material and moral damages. “If there are grounds for suspecting or accusing a diplomat of abusing his children, this falls within the exclusive jurisdiction of the nation he represents — i.e., the Russian Federation. If allegations of child mistreatment prove true, the state will find a way to deal with the abuser,” Astakhov said. According to the largest Dutch news agency, NOS, citing well-informed sources, the saga started with a car accident in which the diplomat’s wife was involved. Possibly drunk, she struck four cars parked near her house on Saturday night. The police traced her car to the Russian Embassy. The diplomat’s neighbors complained to police at the scene of his mistreatment of his children. The police established that Borodin was also intoxicated and decided the children were in danger, after which he was arrested. Even before the diplomatic incident, Russian-Dutch relations were far from rosy. The arrest of the crew of a Greenpeace ship following a protest near the Prirazlomnaya drilling rig in the Pechora Sea undermined them even further. Unable to secure release of the environmental activists through diplomatic channels, the Netherlands, the ship’s flag state, has sought international arbitration. According to experts, bilateral relations might deteriorate even more because of the incident involving the Russian diplomat. “Relations between Russia and the closest allies of the U.S., such as the Netherlands, are such at present that any episode might lead to conflict,” said Timofei Borodachev, head of research programs at the Council on Foreign and Defense Policy. The disputes between Russia and the Netherlands are ill-timed, given that 2013 has been announced the Netherlands-Russia bilateral year. Dutch King Willem-Alexander is scheduled to visit Moscow in early November to sum up the results of the bilateral year and meet with the Russian president. Unless both nations resolve all their differences, assurances of friendship between the two heads of state would ring hollow. According to Borodachev, in this case, the royal visit might be postponed or canceled.